4x4 When and Where﻿ | Wood. It's Real. | Wood. It's Real. 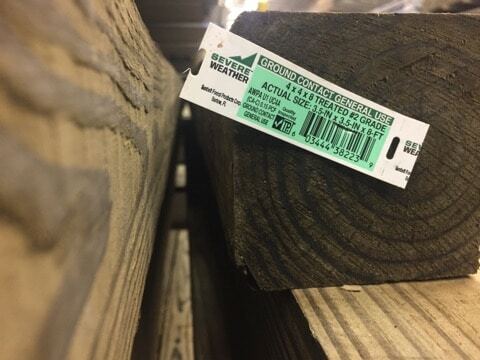 4×4 lumber is stout, tough and looks right for lots of things, but is it? The 4×4 is a unique cut of wood. It’s at once versatile and strong and of a pleasing dimension at 3 ½ x 3 ½-inches. Seems like it’d work in all kinds of places. And it does. Compared to its big brother 6×6 it’s light, easy to maneuver, carry and cut. But there’s a difference between basic functionality and what I call performance. Performance is wrapped up in proportion and aesthetics. So here’s a few examples of where I think 4×4 stands tall. Where the 4×4 is king. 4×4 is king of guardrail post for decks. There’s nothing better. One solid, sweet hunk O’ wood fiber easily fastened and proportional to the other elements around it. My preference for a 4×4 deck post is housed inside the deck framing. I think it creates a cooler look and requires less hardware. Wherever you put it, it’s king. If you’re doing some DIY action on some backyard fun, the 4×4 is your friend. It’s perfect for an A-frame on a swingset for your kids. It provides the stability many designs need and ample wood fiber to make all the connections required. It’s great as posts for a slide platform or tower. And they can be used as foundation skids for a stage or platform. While my favorite fence posts are round poles—check out this video—4×4 is awesome for fence posts. It’s rated for ground contact, which of course matters, and they have the right amount of umph to carry the load. Tips: When I install fence posts, I like them to be all at the same level—and below the top of the fence. To get this look, I install the posts and brace them to each other with 2x4s, then I snap a line and cut the posts before the fencing is applied. Always brace posts if you’re leaving them for more than a few hours. I’ve seen raised garden beds made out of all kinds of things, but rarely 4×4. Why? I think they’re great stacked edge to edge. You can interlock the corners for a cool look (think log cabin). The sides won’t bulge. And there will be a little ledge you can put tools on or rest a cup or your phone while tending the crop. And everything can be screwed together. When purchasing 4×4, buy the straightest pieces you can. If at a home center, try and get the pieces from the undisturbed lift rather than the pile of loose boards at the top. Who knows what’s been going on with those? The undisturbed pieces will be the straightest. When you get them home, store them similarly. Stack them on blocks of wood, not on the ground. And, buy them right before you need to install them so they remain as straight as possible.